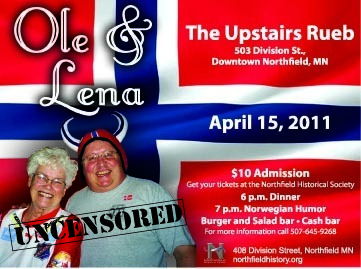 Ole and Lena…Live in Downtown Northfield! Yeah, fer real, Ole and Lena. You’ve heard jokes about them for years, now is your opportunity to see them, live, in downtown Northfield. Friday, April 15th: Ole and Lena Live, 5 to 6 p.m., Rueb’N’Stein, Ray Coudret, 5 p.m., Contented Cow; Jazz Band Concert, 7:30 p.m., Northfield Ballroom; The Dark at the Top of the Stairs, 7:30 p.m., Northfield Arts Guild Theater, Ra Ra Riot Concert, 7:30 p.m., The Pause on the St. Olaf College campus; The Rhythm Project, 7:30 p.m., Dittmann Studio on the St. Olaf College campus; Ian Alexy, 8 to 11 p.m., Tavern Lounge; Area 51, 8 p.m., Contented; Pacifica String Quartet, 8:15 p.m., Urness Recital Hall on the St. Olaf College campus; Karaoke, 9 p.m., Rueb’N’Stein; and Diggins Anton Jennings, 9:30 p.m., 620 Grill. Saturday, April 16th: Imagination Celebration Exhibit Opening, 10 a.m. to 3 p.m., Northfield Arts Guild; Cannon Valley Youth Orchestra Spring Concert, 4 p.m., Emmaus Baptist Church; Occasional Jazz, 5 p.m., Contented Cow; The Dark at the Top of the Stairs, 7:30 p.m., Northfield Arts Guild Theater; The Rhythm Project, 7:30 p.m., Dittmann Studio on the St. Olaf College campus; The Rose Ensemble, 8 p.m., Concert Hall on the Carleton College campus; Chris Silver Band, 8 p.m., Contented Cow; Sasha Mercedes, 8 to 11 p.m., Tavern Lounge; and D J Music at the Rueb’N’Stein and 620 Grill. Sunday, April 17th: The Dark at the Top of the Stairs, 2 p.m., Northfield Arts Guild Theater; The Rhythm Project, 2 p.m., Dittmann Center Studio on the St. Olaf College campus; Opening Reception: Senior Show, 2 to 4 p.m., Flaten Art Museum on the St. Olaf College campus; Laudie Porter Concert, 3 to 4:30 p.m., Concert Hall on the Carleton College campus; Oratorio Concert: The St. Olaf Orchestra and the Chapel Choir, 3:30 p.m., Boe Chapel on the St. Olaf College campus; Politics & a Pint, 6:30 p.m., Northern Roots Session, 7:30 p.m., and Quiz Night, 8:00 p.m., all at the Contented Cow. The Entertainment Guide was wrong on the time for Ole and Lena. Dinner is 6-7 and the Norwegian Humor starts at 7. Oh no, dozens of humor-seeking Norwegian-Americans may descend on the Rueb’N’Stein an hour early! How will they ever while away an hour in a Gasthaus?